... which, thanks to the ever-trusty Google Translate tool and my online pal Cara (thanks, Cara! ), I know means "hair ribbons". Back in August, I was asked by Tula herself and the nice people at Free Spirit / Westminster if I would be interested in designing and making a quilt featuring the Parisville line. 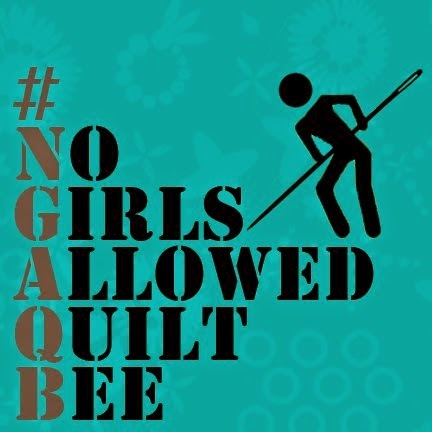 The quilt would hang at Quilt Market in Houston to showcase the line, and the pattern would be made available as a free pattern to accompany the line on the Free Spirit site. It took me all of about two seconds (just enough time to pick my jaw up off of the floor) to say "yes!" A chance to play with the as-yet unreleased Parisville? And have something actually on display at market?! Duh. My mind began thinking of a bunch of different directions I could go in with my design. I was a bit overwhelmed and anxious about it, to be honest. It wasn't until I actually spoke to Tula on the phone about the project that my idea really started to come together. You see, she told me a little more about the line itself and her thinking and design process in pulling it all together. The thing that stuck most in my mind was a single comment that Tula said: "it's really ALL about the hair." I sketched out some ideas on graph paper, and realized that the ribbons could be assembled from some of the most basic of quilt blocks: simple squares and rectangles, half-square triangles, and flying geese. By this point I had the precious cuts of fabric in hand and headed over to my local shop (Wish Upon a Quilt) to pick out some coordinating fabrics. (Here's a tip for anyone who has purchased the Mist colorway: the Free Spirit solids in ICE, ORCHID, CREAM, & OLIVE (an Amy Butler solid) coordinate wonderfully with the prints. I can provide the FS#'s if you want them.) I couldn't decide on a single solid to use, so I decided to use all of them. I created a rugby stripe-like effect with the four different colors. And now, some beauty shots of the quilting. Once again, I collaborated with Bethany (of bethanyquilts.com) to work on a design that would really highlight the quilt pattern and prints. Bethany really delivered the goods! Bethany alternated between two different quilting designs -- one in the blue and cream layers, and one in the purple and green layers. They remind me of intricate lacework, and the dense quilting on the solid portions of the quilt really allowed the ribbons featuring Tula's masterful design work to pop. And what it was all leading up to ... on display at Quilt Market in Houston!! 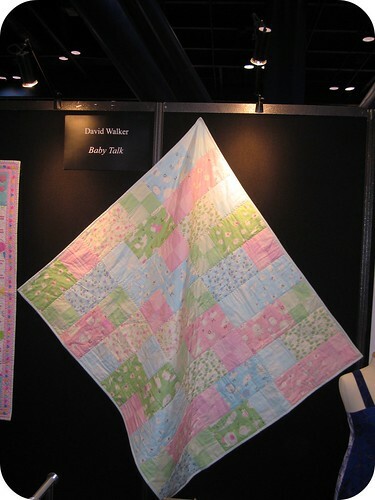 I was so fortunate not only to have my quilt hanging at market, but to be able to attend and see it in person. It was really a big moment for me, for which I am very, very grateful. 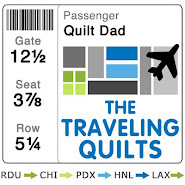 The quilt was hanging in the Free Spirit / Westminster row, where the company reps were holding all of their customer meetings. Every new line was showcased by a single quilt. 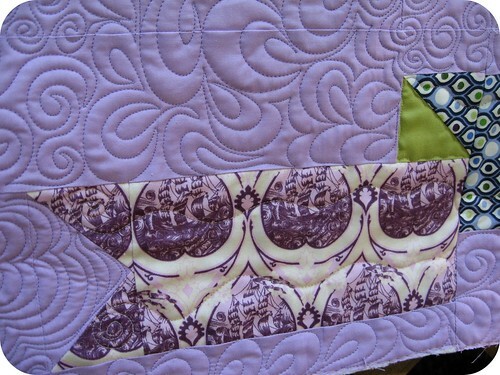 I'll post on that quilt separately, but let me just tell you -- the line features both unicorns and narwhals. That's a sure sign of a winner in my book. I received the most wonderful feedback on the quilt from Tula herself, the folks from Free Spirit / Westminster, and my many quilt market buddies. The one comment I heard over and over again was that it was just so original and "didn't look like anything else". And I take that as the highest compliment. Neither of the two patterns ("Rubans de cheveux" nor "ABC Menagerie") have been posted to the Free Spirit site yet. I will be sure to let you all know when they do. Or, let me know if you see them first! 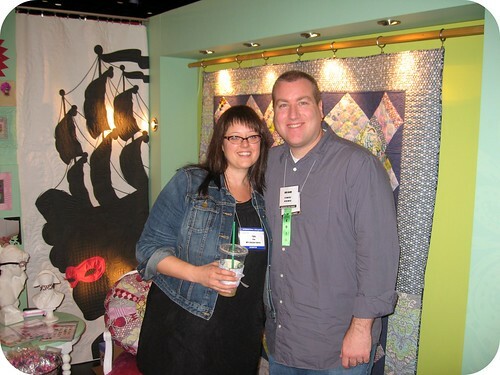 Here's a picture of me and the woman herself, Tula Pink. It was great to finally get to meet her in person after striking up an online friendship so long ago when I first posted my Full Moon Forest quilt blocks. I only wish we could have hung out more ... but there's always Salt Lake City! Tula's booth at market was absolutely stunning, and I am ecstatic that Parisville is finally hitting the stores so that all of you can have as much fun playing with it as I did. And no post about Tula would be complete without a picture of my puppy (also named Tula!) She's getting SO big -- way bigger than I ever expected her to get. She's a GREAT dog. We really lucked out. John, you are doing a fabulous job with your quilts. That Parisville quilt is out of this world! 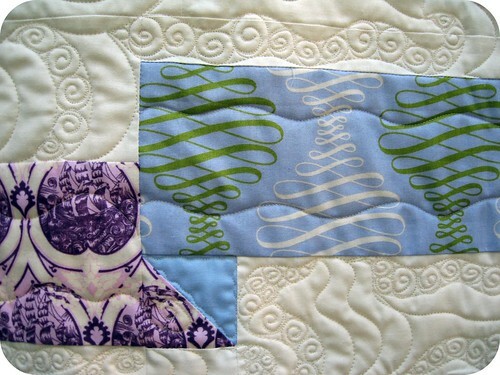 The machine quilting by Bethany really enhances the design of the quilt. I was studying some of the stitching and just thought Wow. Such a cool honor to make a quilt for Tula Pink. Good for you - you deserve it! 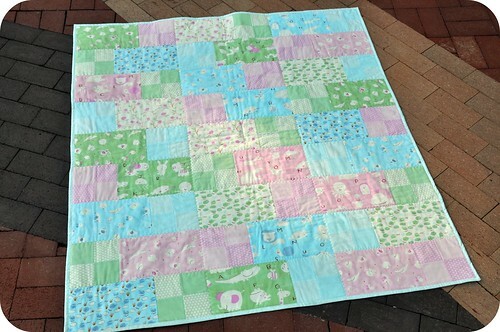 Lovely quilt with a sweet quilting! it really is an awesome quilt, John - and so perfectly done as well. Beautiful! Lil Miss Tula is getting so big!!! Great job on the designing. AND what an honor to have a quilt on display at Market. 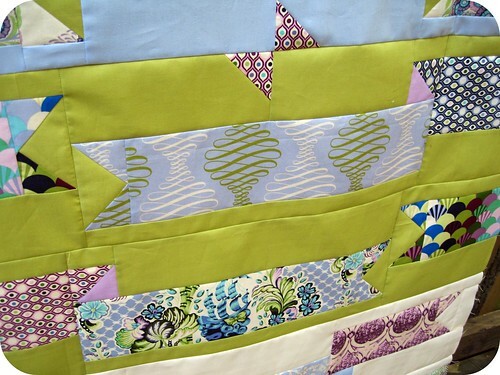 Your Parisville quilt is gorgeous!!! I only whizzed by her booth so I didn't see it but for a glance - nice job!!!! Congratulations! The design is great too - I've been contemplating a tree skirt, and I think ribbons are just the design for it. That quilt is amazing. Beautiful. Congrats on your market debut. I would love to go. It looks like so much fun. Looks stunning! Just waiting for my Parisville to turn up now and then I can create! That is a very beautiful quilt. How fun for you to see it in such and awesome setting! Thanks so much for sharing the whole process! 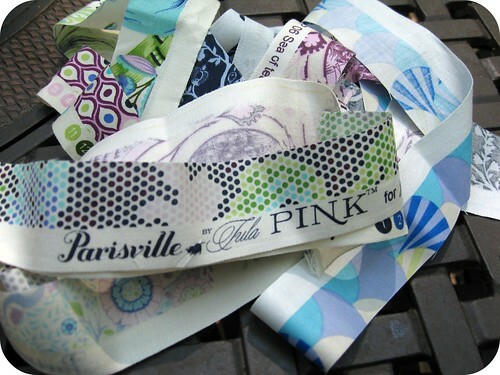 The ribbon theme does a great job of showing off the great prints in this collection! This is the first chance I've had to see the quilt up close, and the quilting complements all your piecing perfectly. I'm still getting over the fact that you talked to Tula Pink *on the phone*. Can't wait to see your next project! Congrats on your quilt pattern! I'm totally in love with it (and Parisville, of course). And Tula the dog is beyond adorable!!! I hope you and your family have a wonderful Thanksgiving. :) Thanks for your continuing inspiration! And on that note, have a sweet holiday, and let Tula have a little taste of turkey, ok? Tula is so pretty! I had a landscaping client with a dog that looked like that, SOOO SOFT! 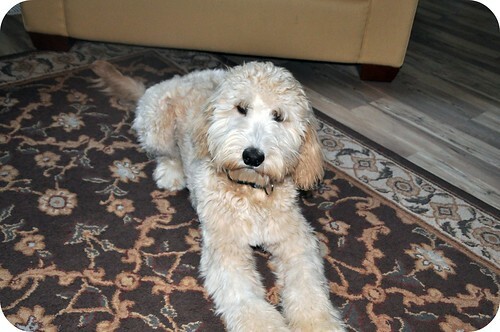 She was a Wheaton terrier, and when I met her I wanted one someday! Such a sweet and good dog! Your quilts look wonderful! I love how you used those HSTs to make it look like the folds of the ribbons! 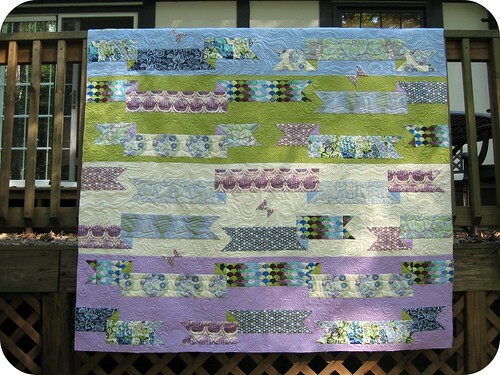 Not sure if I ever commented on your blog before, but I just HAD to leave a comment on this one and tell you how much I love that ribbon quilt. You have truly outdone yourself -- it is such an original and stunning design. Congratulations! 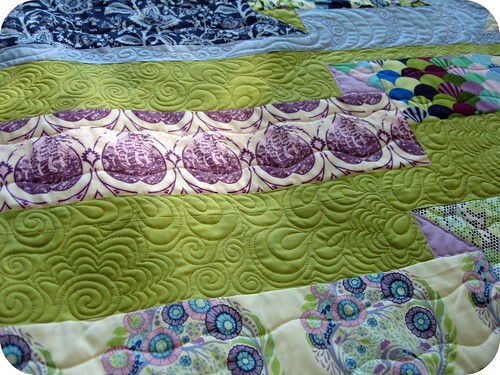 Your quilt is just stunning, and your quilter, Bethany, does the most fantastic job of pulling your design together. It's a great honor to have your quilt hung at Market - WOW!! John, I've read your blog for many months now but this is the first time I've written. I simply think that what you did to achieve those banners and flags is stupendous. Have a wonderful Thanksgiving. Love the quilt! How exciting! Congratulations! Your ribbon quilt is great John! I really love it! John I love this quilt. It has to be one of my favorite quilts I have seen this year! 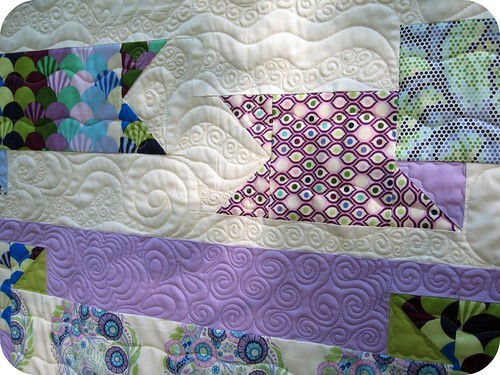 that ribbon quilt is GORGEOUS! 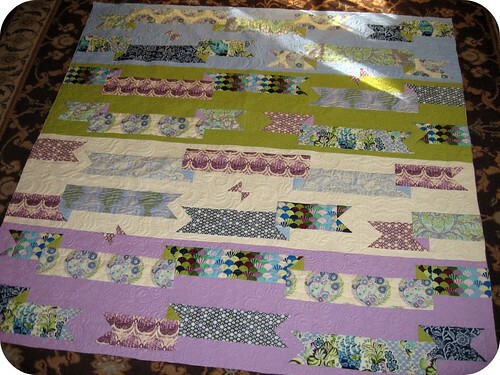 Your ribbon quilt is fabulous and can't wait until it is online for all of us to try!! Excuse-me but "ruban de cheveux" is not correct french ! (it means something like a ribbon made of hair!) you should say "ruban pour les cheveux" ! (my mother tongue is french). The quilts are both great John! Good job getting them both done for the Free Spirit Booth! See you in SLC!! 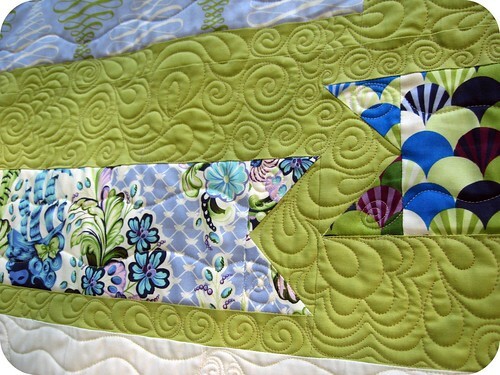 Absolutely fabulous quilt and oh I love the selveges. My sister has just come home (New Zealand) from a trip to Italy and France and I was searching everywhere for selveges with the right words to cover a notebook for her memoirs... And there you have it. good job John, the Parisville quilt is amazingly beautiful.... love it! Fab quilt, John! It's gorgeous and original! Round of applause! Congrats and here's to more such opportunities! The Parisville quilt is unique and beautiful- wonderful job! The Parisville quilt is stunning and the quilting is also amazing! Wonderful! Your Parisville quilt is amazing! Did you get your quilt back, John? Because the last time I was here, you said the market wasn't giving it back. Dear gods, I hope so! Beautiful name for a beautiful project! Really amazing, I have tried in this way turns the changes are felt, within a single day of my blog on the first page, I am very grateful to you, I hope you can survive long web :).